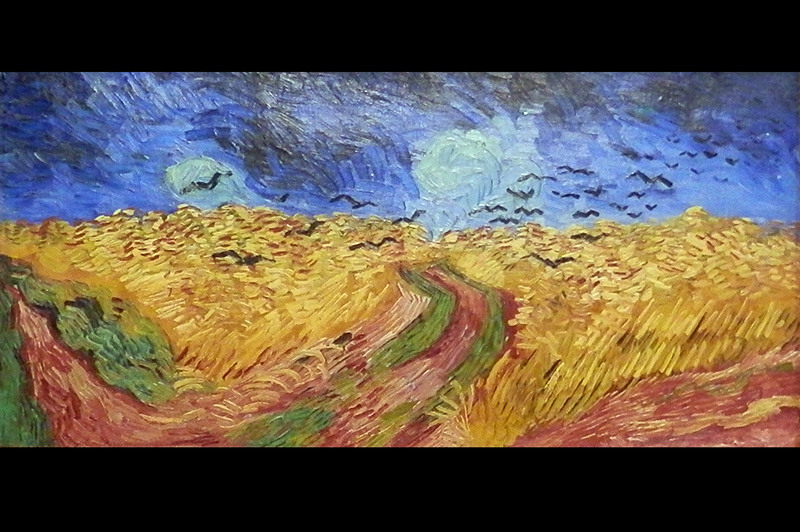 Wheatfield with Crows. Many people though that this was Vincent's final painting, however new findings reveal that an unfinished work on his easel is believed to be his last work, entitled "Tree Roots." We arrived at the Amsterdam Schipol Airport at 12:30 p.m. This gave us 2 1/2 days to explore the city before we had to meet our Rick Steves tour group in Haarlem at 2 p.m. on May 24, 2015. We were so happy that we did this because we were able to discover almost everything Amsterdam had to offer. The Schipol Airport has a direct train that takes you to the Amsterdam Centraal Station. We bought our tickets online at www.b-euope.com. This allowed us to skip the hassle of using a ticket machine after arriving. A Rick Steves forum member advised us that this is the best option for Americans because the Netherlands website at www.ns.nl/en requires a Netherlands bank account for payment. We immediately took Rick Steves advice and used the closest ATM to withdraw Euro cash and get the best exchange rate for our dollars. Finding our way to the train station from the airport was tricky. There were no signs directing to it. We found an airport employee who was able to inform us that we would see it after we went through customs. He was right. The TV monitors in the station quickly showed us which platform had the train going to Amsterdam Centraal Station. We arrived at Amsterdam Centraal and the bed & breakfast we had booked was only a few minutes walk from the station. At the Barangay B&B (an amazing choice) we were immediately greeted by a friendly staff member who offered us a beverage of our choice: beer, wine, cocktail, soda or espresso. Both Summer and I opted for an espresso and it came with a delicious chocolate! While we sipped our espressos and rested our feet, the employee gave us an overview of the city and how the transportation worked. He made several notes on the free map he gave us and highlighted some key areas we may want to visit. This was an excellent way to get oriented to a new city! On our way to our room we experienced an infamous Dutch staircase, which is extremely steep, narrow and windy. The reason being is that the Dutch were taxed on the width of their homes and businesses, so they built them thin but high and deep. Their design for staircases were an efficient use of space. Our room was small (like most other hotels in Amsterdam), however it was decorated beautifully (with towels on our beds in the shape of swans) and had features that made efficient use of the space. The headboard, in particular, stored an espresso machine, coffee/tea station, refrigerator and space for us to hang clothes. The bathroom was modern, designed with a walk-in tiled shower and two sinks. The room included a small table which held a complimentary bottle of wine for our stay. Beside it was a door that led to a gorgeous patio (which lit up with lights at night). It also had miniature lizard figurines glued in various corners of the walls and ceiling which we thought was a fun an quirky treat! The accommodations and service at the Barangay B&B were amazing! Each day we enjoyed a huge breakfast in bed with an assortment of orange juice, coffee, cereal, yogurt, bread, fresh fruit, and a main course that rotated each day, which included omelets, crepes and a selection of meats and cheeses. The staff was extremely friendly and inviting. We couldn’t recommend a better place to stay in Amsterdam! We walked to the Central Library because it had a great view overlooking the city for free. The library was unlike any one we had ever seen before. It had 10 floors with escalators leading to each, modern decor, lots of computers on every floor, rows and rows of books and music CDs, tons of seating for you to relax, and even a spacious cafe. Next, we tried to start the Rick Steves audio walking tour of the Jordaan area, but we could not find the starting point on our map. There was a certain section of roads that all weaved together and not all had a street marker, making it difficult to really know where we were. After walking through a congested shopping area mobbed with tourists, we finally found the right starting point. We enjoyed the Rick’s narration as we explored canals, the Anne Frank House, Westerkerk Church, gabled houses and house boats. It was a great way to introduce us to the peaceful parts of the city while getting a great education on the architecture. We stopped at Restaurant De Ettuin for dinner in the Jordaan area. We were amazed at how cheap wine was here – only 3.50 Euro per glass! Stephen had a free range chicken with a cabbage salad mixture and frites, while Summer had a hamburger with frites. It was all delicious! We enjoyed our first breakfast in bed which consisted of fresh fruit, breads, yogurt, omelets, cereal, coffee and orange juice. Close by was a Albert Heijn grocery store that allowed us to stock up on some rations for the rest of the trip that we didn’t bring with us, such as sunscreen, shower gel, snack bars, etc. We then walked to our reserved wine and cheese tasting at the Reypenaer Tasting Room. It was an extremely fun activity to do! There, we had an energetic host who taught us all about how cheese is made and helped us learn how to identify the subtle notes of six different types of cheeses. To cut the cheese into thin slices we used an actual cheese guillotine. We also paired the cheeses with three wines. We also learned that “gouda” cheese is actually pronounced “hkooda” and is the name for the round shape of cheese, not location or flavor as many people seem to think. We walked through the Bloemenmarkt (floating flower market) and saw a variety of beautiful flowers and seeds for sale. We also stopped in a few stores to window shop. One thing we did buy from each country and city we stayed in on the tour were postcards. Postcards were an inexpensive (and light) way for us to bring back a collection of souvenirs that visually represented what sights we saw and things we experienced. We had one odd experience we thought was a pickpocket scheme. When walking across a busy intersection near the Bloemenmarkt, Stephen noticed a man in sunglasses standing at the corner of a brick building. When we crossed near him he made a hand gesture with two fingers on his stomach pointed towards us. We moved to a corner on the other side of the building to look at our smartphone for directions and the man came around the corner and stared at us. We stared back and he didn’t flinch. We then crossed the street to a far off location and the man then walked around the building and kept staring at us. It was very weird. We went into an optical shop and asked for directions for where we were going and immediately left that area unscathed. We then took a tram to the Van Gogh Museum. Since it was a Friday afternoon, the line was not long at all. We got the audio guide and it was a great investment! The museum would not have been as great of an experience without it. We learned all about Van Gogh’s life and work, how his style changed throughout the years, and how many people believe his “Wheatfield with Crows” painting was his final work before he committed suicide, when in reality it was and unfinished painting “Tree Roots” which was on his easel when he died. We strolled through the Museumplein and saw sculptures of rabbits that were painted in all different types of cute designs, including a duck, cat, delft blue and more. We also saw the I Amsterdam sign but were not able to get a good picture of it because so many kids where jumping and standing on it. Next, we went to Amsterdam’s public urban park, Vondelpark. Here we saw many groups of young people smoking marijuana, drinking beers and wine, and having a good time without getting out of control. It was a very peaceful and inviting atmosphere with a huge lake in the middle. Later, we walked to one of the busiest centers for nightlight in Amsterdam, the Leidseplein. It had lots of cafes and very crowded with people, but not intimidating at all. It was hard to pick a restaurant to eat at because there were so many to choose from. However, we ended up eating at Ristorante Italiano Peppino because it offered us an opportunity for people watching and cheap pizza and beer. Stephen tried an Amstel Radler (also known as “Shandy”) beer, which we had never heard of. It is a mixture of lemonade and beer, which is actually quite refreshing and delicious! After dinner, we took the tram back to our bed and breakfast. In the morning we took the bus to the Dutch Resistance Museum. On the way we saw a huge hoard of people coming out of the Amsterdam Centraal Station. It was a good thing that we chose to get away from the city center today and avoided the hoard. In the museum we learned about how the Dutch handled the Nazi invasion during WWII. Unfortunately, the Netherlands was in an economic crisis with a huge discrepancy between the rich and poor. It was also divided into different political and religious groups: the “pillars,” wish is why it was so easy for the Germans to take over. After the museum, we headed toward Winkel Cafe in the Joordan area. This spot is consider to have the best tasting aapeltaart (apple pie) in the city. On the way we stumbled across the Lindengracht Market. It was bustling with locals who were shopping for fresh fruits and vegetables, cheeses, meats, fish and even clothing. Stephen tried the classic “Amsterdam Herring” here and even though he doesn’t like much seafood, he thought it was actually quite good! We eventually made it to Winkel Cafe and it was packed with people. A line was out the door and all of the outside seating was taken. Luckily, Summer found a free table inside and grabbed it while Stephen waited in line to order the food. We devoured the delicious appeltaart along with a fresh mint leaf tea (which most of the locals were also having). We then strolled through the Joordan area, enjoying the lovely atmosphere. It was great to be here as opposed to the busy city center with the hoard of people we saw that morning. We popped into a cheese shop who was offering a free wine tasting. Stephen impressed the French wine host with his comments about the flavors and notes of the wines and she thought we were from the California wine region! We stopped at a corner cafe and enjoyed a drink while observing Dutch life pass us by. We discovered that this is how many locals live here, by meeting friends or family at a cafe and sit outside with a dink while catching up with each other. We discovered that canal side seating was hard to come by and many restaurants required a reservation. We eventually got into a small pizzeria and we ate outside on the street. However, by that time it started to get cold and windy and it was not very pleasant. We then went back to the bed and breakfast in order to pack for our journey to Haarlem the next day to meet our Rick Steves tour group. On this day, Summer coined a fun phrase we used for the rest of the trip. She said “We must take steps to thwart theft!” After reading about all of the pick pocket schemes before coming over to Europe we were a bit paranoid. So, we continued to “thwart theft” everywhere we went 🙂 Eventually, we realized that as long as you are aware of your surroundings and keep your bag over your shoulder and under a hand, no one is going to mess with you. Pick pockets want the easy targets, not the people that are conscious of their threat.